*Edited to add dpi settings to Step 7 of tutorial. I have a pair of scissors for fabric, a pair for rubber, a pair of snips for paper and pair for ribbon. I have rotary blade cutters , guillotine cutters, X-acto knives and a great Olfa snap-off blade cutter that I use all the time. I have a carousel of neglected decorative scissors. You'd think I was a cutting expert from looking at this collection but you'd be wrong. Because I am a bit of a perfectionist I am never quite happy with my cutting ability. I feel clumsy when cutting outside the line of a stamped image. I leave too much paper or cut into the image. It's not clean and uniform. And if I need to cut in a tight area like the back of the worm here or inside an image like yesterday's airplane forget about neatness. But I don't feel so clumsy today. Today I feel like a genius. 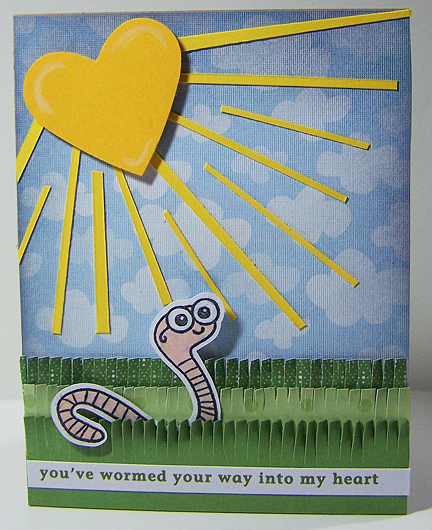 Isn't that a brilliant cutting job on the wormy? It's perfect. I didn't increase my scissor skills or knife prowess overnight. No. I let the Silhouette do it. I figured out how use my Silhouette Studio (V1.3.0) to create the perfect shape for this stamp and it would work for any stamp. I use Photoshop (CS4) and but I'm sure you could do the same thing with any edit imaging software that you can scan images into (you may even be able to make it work with hand coloring). This tutorial uses operations in the programs I have, you may need to adjust for your own programs. Stamp the image on white paper and scan into the computer. The darker/cleaner the stamped image the better. Open the image in Photoshop. Go to Select and scroll to Inverse so that only the stamped image is selected. Make sure your background color is black then hit Delete, this will turn your image a solid black. Clean up any areas that look dodgy with the pencil tool and/or erasure tool. With the image selected go to Image and scroll to Crop. Go to File and scroll to Save As and filename.jpg Close file. (choose your own filename. I use the stamp company's name followed by the stamp set name and a description of the image) !! Save at 72 dpi or your image will not match your stamp!! Open Silhouette Studio and open filename.jpg. OR you can drag the file from its folder directly onto the Silhouette work area. Click on Select Trace Area. With the Select tool selected draw a box around the image. 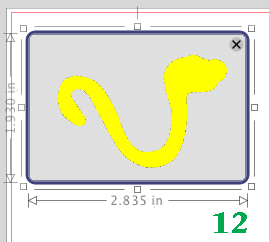 Your Trace Settings should be set so that your image is filled with yellow. Click on the solid image and Delete it. You will be left with the outline of the image. Go to File and scroll to Save to Library. Go to Offset Select Shape and change the offset to approximately .045" to put a little bit of paper around your image. 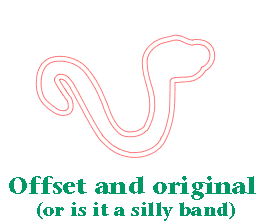 Of course you can adjust the Offset to your own tastes. I tried to stamp on a piece that was cut to the exact size and it was nearly impossible, I couldn't see through the acrylic block and stamp well enough to make it work. Click on the original shape and (re)move it from the offset shape. If you don't when you cut you will get two shapes, the original and one that looks an awful lot like a silly band. As much as I like this method I will keep my metal dies, thank you very much. I love running dies through my Cuttlebug and it's a lot quicker than going through all these steps. I will also continue to cut things out with my snips and my Olfa but this is a great way to get a clean cut on stamp shapes that require delicate interior cutting like the airplane I shared yesterday. 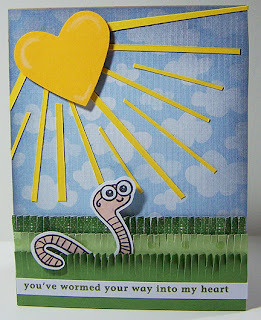 Paper: Patterned paper from K&Company Actopus to Zelephant Designer Mat Pad , All other paper from Stampin' Up! in Old Olive, Certainly Celery, Whisper White, Summer Sun, & Crushed Curry. Grass made with Multi-Blade scissors. Heart punch from Stampin' Up! Click here to help my son pay his own way through scouts. Order Trail's End popcorn using code 79936evan674 and great tasting treats will be delivered to your door. I'm not a stamper.. so I'm a little confused as to what the end product is. Did you then stamp on the cut out card stock? Good point Nicki. Yes I stamped on the paper after it was cut. I think you have a technical writing career ahead of you (remember the cardinal rule of only one direction per step!). You bolded the buttons and everything so you get an A+ from me. One day when I am screwing around, I will try this (since it incorporates my PS and Silhouette). Great job. And I appreciate the clarification in the comments too! Thanks for the tutorial. Very clear and easy to follow. You sound just like me. A pair of different sissors for each occasion. Thank you for your tutorial! I am a follower now. I have a question: After you've imported a scanned image into the silhouette software, can it be resized (larger)? Thank you for your time. I am so excited to try this new technique! Melody, you can resize it but if you are scanning in for this tutorial you will not be able to stamp in the enlarged cut out. WAAAAAY over my head, too, but I must say that I LOVE the end product! Looks great! Tam I would love to use this machine to help you guys with your classroom decor. Call me if you're interested. Brialliant! I can't wait to try this! Thanks so much for taking the time to type it all out! Thank you SO much for this tutorial! Bounced over here from Spotted Canary - I am SOOOO using this idea! :) Thanks again! Corey I used the tutorial again to test, thinking maybe I missed a step and there are a couple of things that could be problematic. 1. I forgot the 72 dpi restriction on file size when I scanned at 300 or 600 dpi the image was too large. 2. I forgot to add Close the file after you have saved it. Perhaps you are trying to open the file in 2 different programs which can't happen. I will add these to the tutorial. If you are still having problems you can email me and maybe we can figure it out over the phone. Terrific tutorial. Thanks. I have a suggestion for stamping exactly where you want every time. Use a Stamp-a-ma-jig tool. IMO, this is the only stamp positioning tool that really works. Another little trick is to use double-sided removable tape to hold your paper to your work table so it doesn't accidentally move. I wrote it, if you quote it, please note it. All material here is copyright Katemade Designs unless otherwise noted. All opinions are my own. You may CASE my work, but please do not submit my designs to publications or contests as your own. All free items offered here are copyright free unless otherwise noted. You MAY use them in your artwork. You MAY sell your artwork. If you do sell your artwork, first of all, congratulations, second please send me a link to it, I'd love to see what you've created. You may NOT sell these images as is in any form: as a printout, on a CD or online (or in any other method the techies dream up). If I receive a product to review, I will make note of how it was acquired. I only recommend products I would use. I do not accept offers of direct payment for dedicated blog posts to promote products. I belong to the following affiliate programs: Amazon, Blick Art Materials, Simon Says Stamp, Hallmark Scrapbook & Craft, Grammarly, Hootsuite Media Inc, Blitsy, and Craftsy. Affiliate links are used when possible. © Katemade Designs. Watermark theme. Powered by Blogger.